The High Tech Extrusion group presents its new TEC 4s. This control system has been already delivered with orders for extruders in the last months but now it can be also ordered as retrofit kit exclusively for High Tech Extrusion – Theysohn Extruders. High Tech Extrusion, consisting of the companies Theysohn, Technoplast, Topf and Extruder-Komponenten Salzgitter, is an “all-in-one” provider which has developed a unique series of extrusion lines, tools and pipe heads. After the latest development of the new OMNIA series and the new RK Streamliner pipe head, High Tech Extrusion now presents the new TEC 4s as retrofit kit. The new Extruder Control System TEC 4s, developed in cooperation with Siemens according to the newest state-of-the-art technique, combines simple handling and an efficient control system in a unique way. An operating terminal optimized for heavy industrial conditions enables a comfortable control of the whole extrusion line in combination with the modern HMI-Software. The 19“ touch screen guarantees easiest operation with large soft-keys and intuitive colour and graphic design. The core of the new Theysohn Extruder Control System is a powerful, fanless and therefore maintenance-free industrial-PC. 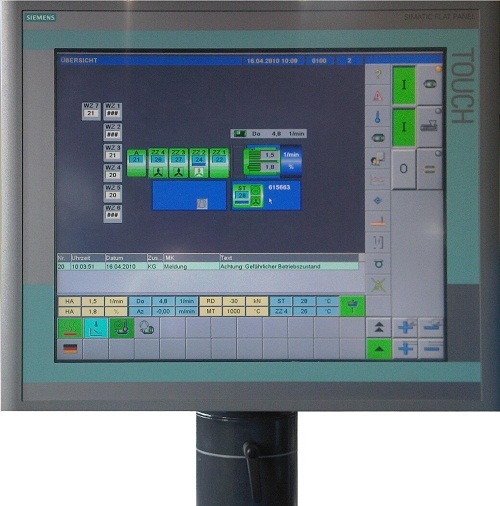 The communication between the TEC 4s and all drives, peripheral devices and the whole downstream equipment works through the most efficient bussystem – PROFIBUS. Operational reliability and short down time are achieved by simple wiring because of selected high-class components, an analysis program and remote maintenance via LAN and/or WAN. The major advantage is that in 99 % of all cases the customer himself can maintain or exchange spart part of the system. This saves of the visit of a Theysohn technician.A few simple steps without big technical know-how are sufficient to change frequency converters or CF-cards and therefore production downtime can be avoided respectively software updates can be installed simply and quickly.